Last Wednesday, I met Mr. and Mrs. sinosoul, Rants and Craves, and The Roaming Belly at Allston Yacht Club for a hosted dinner. 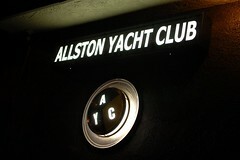 Named after a neighborhood in Boston, Allston Yacht Club is the brainchild of Beantown natives Charles Kelly and Bill DiDonna. 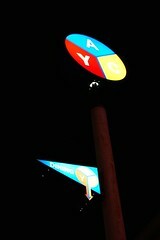 And that's pretty much all I can tell you about the odd moniker for the Echo Park eatery. Bright primary colors adorn the walls. 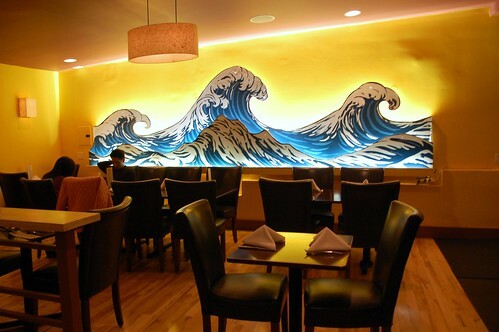 We dined beneath Hokusai-like whitecaps. I didn't get it. Yacht club? 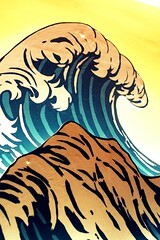 Japanese waves? What kind of food were we about eat? Apparently, small plates of various origins. I still didn't get it, but I went with it. 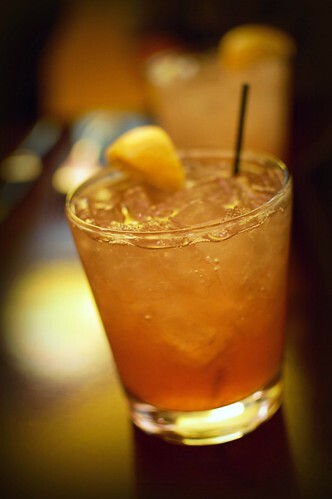 I tried a Tourniquet, which was infused with housemade grenadine. The grenadine was made from real pomegranates, which I loved. I felt like I was sipping perfume during my first few sips. Extremely fragrant. Creative and delightful drink. Frico -- three crisps of Parmesan cheese and sliced shallot. A chip made from fried cheese? Yes, please. 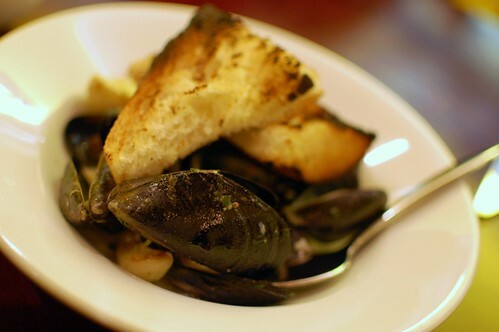 Mrs. sinosoul seemed to like these, so reports this anti-bivalve girl. 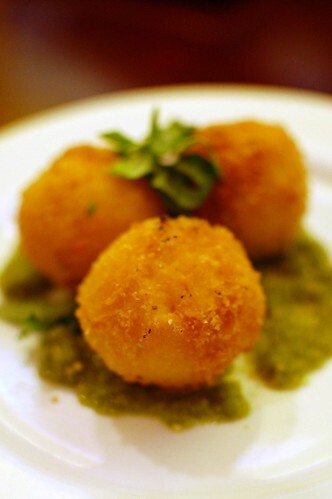 Arancini -- risotto stuffed with peas and mozzarella rolled in panko, deep fried, and served on tomatillo salsa crudo. Golden balls o' gimme-more. As awesome as they look. 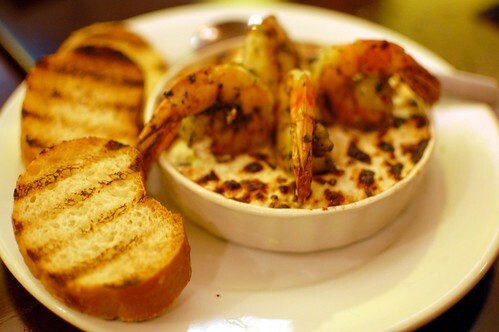 Shrimp and feta gratin -- spice-rubbed shrimp, roasted tomato, and feta. While the shrimp was a tad rubbery, I enjoyed the flavor. The feta was fabulous. Scorched shishito peppers -- cooked quickly over high heat with a shot of ponzu and a pinch of bonito. 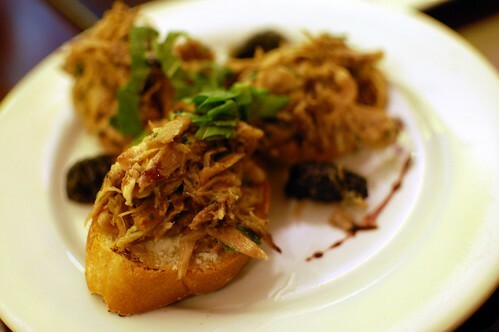 Duck confit, goat cheese toasts, roasted figs. Nicely done and worth ordering, but I've certainly had better. 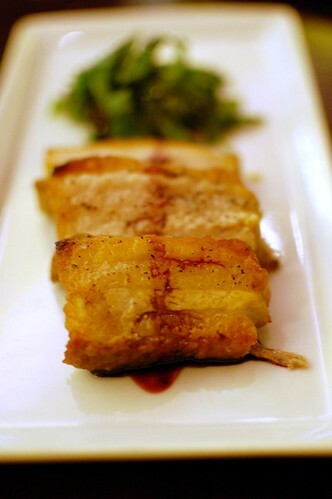 Pork belly -- braised then seared and served with an inebriated cherry salad. I like all pork belly. This was no exception. However, this Allston Yacht Club version must be eaten immediately because it is not merely unctuous; it is super-duper fatty. My hot bite was great. My later cooled-off bite was not-so-great. 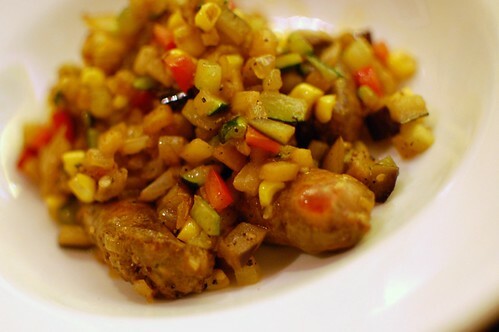 Merguez sausage -- lamb with garlic, cumin, and paprika served with a smoked corn succotash. Are you thinking of certain puddy tat named Sylvester? Just me? I dug the succotash. It did not make me suffer. Quite the opposite. Oh, and the sausage was tasty, too. 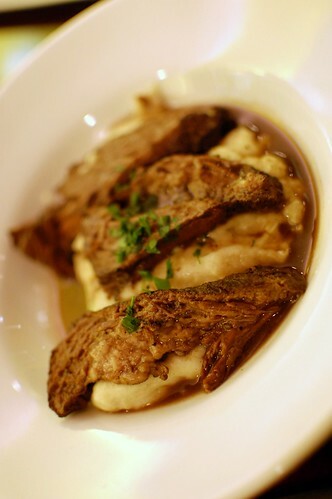 Braised short rib, root vegetable puree. Delectable. The meat was lovely, but methinks "root vegetable puree" is just a fancy way of saying "mashed potatoes." Grilled cheese of the day. 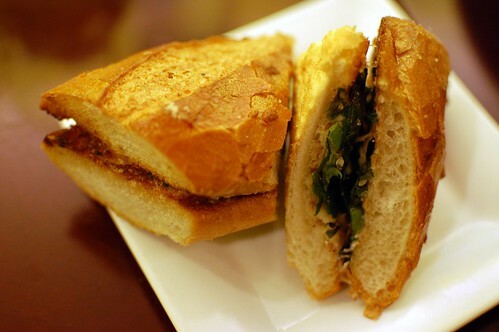 Good crusty bread, but the abundance of green onions overpowered what little cheese was hidden inside. When I eat a grilled cheese sandwich, I want cheese. Lots of it. Boo. 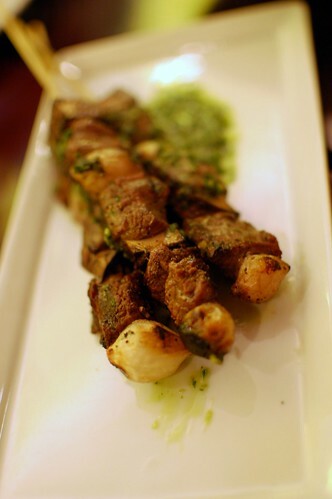 Beef, skewered and grilled with chimichurri, garlic, parsley, olive oil, vinegar, and chili. This dish's seasoning rocked. Like the pork belly, this dish should also be eaten as soon as you get it, as the cubes get progressively tougher as they cool. 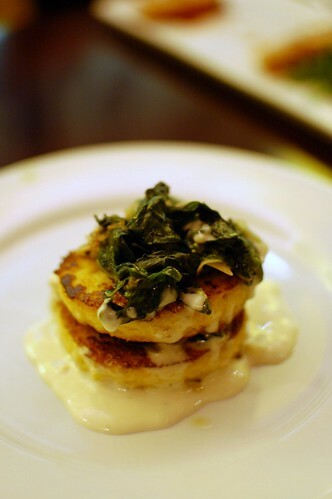 Polenta with greens and gorgonzola -- sauteed seasoned chard, disk of crisped polenta, and a dollop of gorgonzola cream. Welcome to Bland City. This was rather sad. That's all I've got. 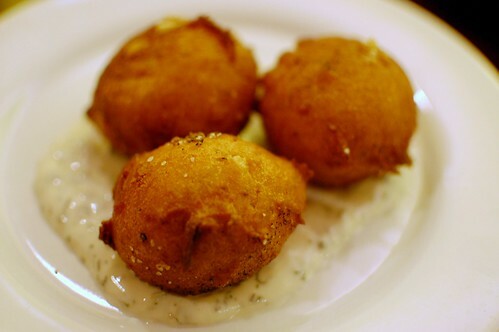 Sweet potato fritters with minted yogurt. Deeeeelicious but ruined by the yogurt. If you like donuts, you'll love these. But I'm a girl who likes her sweet donuts actually sweet, not wading in a pool of tzatziki. By themselves, awesome. In minted yogurt, eww. It just didn't match. I wish these had been on sticks like big donut lollipops and accompanied by some kind of syrup or cream for dipping. These were a good bridge between savory dishes and dessert. 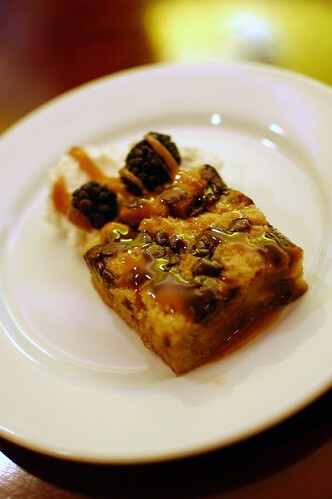 Chocolate chip bread pudding, caramel, cream, berries. Yay for yummy! Not too sweet and just to my liking. Happy warm finale. Allston Yacht Club has heart. Allston Yacht Club has potential. 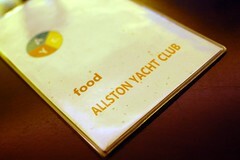 But, at the moment, Allston Yacht Club doesn't have identity, at least not one that was evident to me. 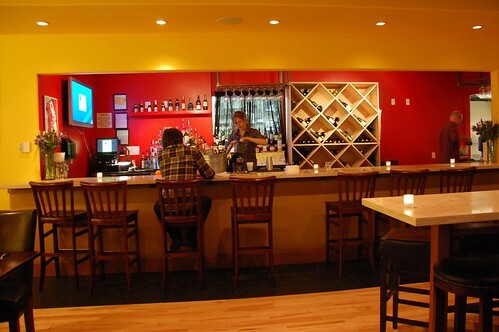 Once Allston Yacht Club figures things out, it will be smooth sailing -- a damn good place to frequent, especially for groups. Even in its current state, however, the place is still worth a visit, especially on Wicked Wednesdays, when every dish is only $5. $5 is a good deal. The arancini look great. Hopefully, they will find their groove. I am crying over the failed shishitou. Because it really isn't difficult to make these taste good but it is so difficult to find good shishitou in a restaurant. I'm about to grow my own this summer. I would have thought the yacht club would have more seafood! And FWIW, when I make something with turnips and/or parsnips I tend to call it a "root vegetable" dish...so it's possible your mashed potatoes had one or both in them. What a weird concept for a "Yacht Club" restaurant. I grew up sailing and have been to a number of yacht clubs all over the world- including Boston- and they are yuppie central. This food looks *much* more interesting than what I'd expect. Decor is odd. I still say we shoulda dressed up in khakis & Sperry Top Siders, sweater tied over the shoulders! All jokes aside, I really do want this place to succeed. I hope they do well! Good times w/ you as always! 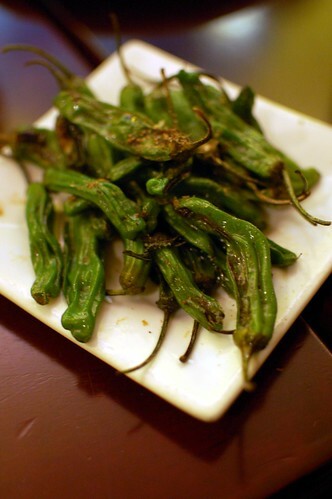 We had Scorched shishito peppers on our most recent small plates outing. I was unimpressed as well. Mashed potatoes sounds much better to me than "root vegetable puree". I'm a simple midwestern gal though. great meeting you! i love your pics. i wish i had a bite of that dessert though...mmmm. I went to Africa with Charles' sister-in-law--who lives in Portland. 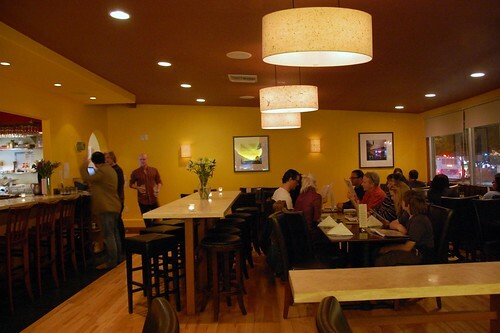 We had a mini-reunion at this restaurant when the owners first took over but before the name change. I need to check it out with the new name/vibe. I am turned off by the overly green grilled cheese. Thanks for the honest report. And yeah, when I order a grilled cheese, I need to be able to actually *see* the cheese. Boooo! For a second, I was really excited to think that you may be right down the road (and then sad because you didn't call me) until I saw it was in Echo Park. perhaps it is the picture, but it appears most of your meals are micro-sized. so tell me, do you ever leave a restaurant hungry? i am a big eater and feel like it never seems like enough food. then again, i guess if you have several courses that might make up for it. 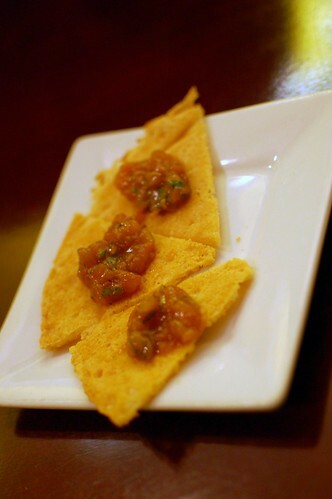 i went to a fancy-schmance place once where we had five course but they were so small we all left hungry. maybe that's a clue to why we're all fat in my family? lol!